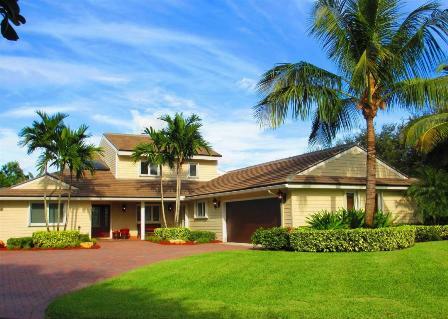 Tequesta, FL is the kind of spot where you just can’t fail to find a place to live. With so many subdivisions, condominiums, communities and other places to choose from, it would be pretty difficult to visit and not find a place to stay. River Ridge is just one of many communities in the Tequesta area. It can be found about 2 miles north of the Jupiter Inlet and of the 173 homes within the gated community, the odds are good you can find at least one that suits your specific needs. As of April 21, 2019 there are 2 ACTIVE properties for sale in River Ridge with an average listing price of $1,272,500. The highest-priced ACTIVE property listing is $1,550,000, while the lowest-priced property can be purchased for $995,000. Homes in River Ridge have an average price of $301 per square foot, based on listings with an average of 4 bedrooms, 5 bathrooms, and 4,226 square feet of living space. Search River Ridge homes for sale in Tequesta, Florida below. When you think of the perfect, quiet community in Tequesta, Florida which is ideal for peaceful living, what comes to mind? Is it a place with high end security, a body constantly patrolling the grounds which are protected behind a nigh impenetrable gate? Does it have access to sports and entertainment both on and off the water? How about the living conditions? Well, for a waterfront home in a gated community, a real house and not a condominium, River Ridge has a lot of good points going for it. Of the 173 total homes in the neighborhood, 43 are set up in the mangroves of the Loxahatchee River and provide immediate water access. Read more about River Ridge real estate. Besides the homes of River Ridge which are literally on the ridges of the river, there are 48 more single family homes which are surrounded by several small lakes. The fishing is amazing in this corner of River Ridge and even for those without personal watercraft, it’s still possible to take in some water sports and try to catch a lunker here. The rest of the homes in River Ridge are spread out in a pretty even fashion, over a patch of land bordered by the Jonathon Dickinson State Park to the north and east. Looking to sell or buy a home in River Ridge? Call Snyder Real Estate Group, your neighborhood Tequesta real estate team at at (561) 951-9301. We are River Ridge real estate agents and experts on the River Ridge Tequesta, FL housing market. River Ridge is just 2 miles north of Jupiter Inlet and the Jupiter Inlet Colony, which means Jupiter Mall and all its associated stores are just minutes away. The homes of River Ridge do vary in size and square footage, with some having as many as five full sized bedrooms, with three being the average count. There are multiple full baths in each home as a rule, so the setup is perfect for establishing a home and guest bathroom. Contact us for more information about River Ridge homes for sale in Tequesta, FL and homes which have recently hit the market – you never know when a new listing will come up. Considering the purchase or sale of real estate in River Ridge? Let our team of Tequesta real estate specialists professionally assist in your hunt for the perfect home and skillfully negotiate the sale of your existing Tequesta house. As River Ridge neighborhood real estate agents, we know the unique nature of the River Ridge real estate market. Our real estate pros can get you on the fast-track to your next home today! Call Snyder Real Estate Group today to learn more about buyer or seller representation. Considering the sale of your River Ridge home? Receive a free home assessment, where you can instantly calculate your property's estimated market value in seconds!